“United States Recognition” by Tim Matthewson, Ph.D.
"United States Recognition" by Tim Matthewson, Ph.D.
Matthewson works as a consultant in Washington, D.C. 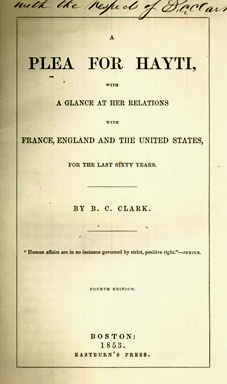 He is the author of A Proslavery Foreign Policy: Haitian-American Relations during the Early Republic (2003). United States recognition of the Republic of Haiti in 1862 is not such a simple subject as might be assumed. The main outlines are that the President Abraham Lincoln recognized the Republic of Haiti following the secession of the Southern States. 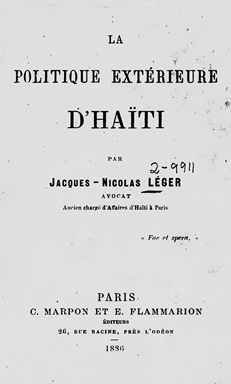 The Southern states had substantial power in both the House of Represent-atives and the U.S. Senate, and Southern State representative had been able to block official recognition of Haiti following the official declaration of Haiti’s independence on 1 January 1801 by Jean Jacques Dessalines. Still American merchants were eager to trade with Haiti and they continued to lobby in favor of recognition, but Southerners greeted their petitions favoring recognition with threats of secession and disunion. In 1813, however, the James Madison administration had decided to throw some crumbs to the merchants and it appointed commercial agents to the major ports of the former French colony in 1813, hoping to gain some support from the merchants in favor of its war polices, as the U.S. entered the War of 1812.